Hawaii’s Annual Hispanic Heritage Festival is this SATURDAY! Let’s keep the party going after the Hispanic Heritage Festival with Wally Rita Y Los Kauaianos and Mariachi Los Toreros! 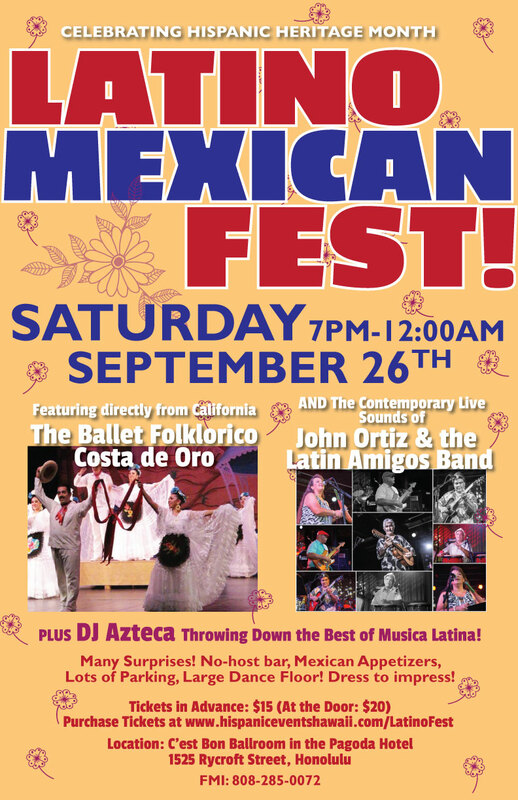 Latino-Mexican Fest – September 26th! Join Us for another great event, celebrating Hispanic Heritage Month….. “Latino ~ Mexican Fest! Sept. 26th (Saturday), 7pm to 12mn in the beautiful C’est Bon Ballroom in the Pagoda Hotel, 1525 Rycroft Street. Featuring directly from California The Ballet Folklorico Costa de Oro with their beautiful dances & costumes of Mexico! The Ballet Folklórico Costa de Oro is dedicated to the preservation of Mexican traditions and culture. Dance and music are the tools used to educate the youth and community about Mexico’s rich and beautiful history. Joining them will be the very popular Latin/Contemporary Live sounds of “John Ortiz” & the Latin Amigos Band! For your dancing pleasure! “DJ Azteca” throwing down the best of musica Latina! Many surprises!!!! No-host Bar! Mexican Appetizers will be available! Lots of Parking! Large Dance Floor! 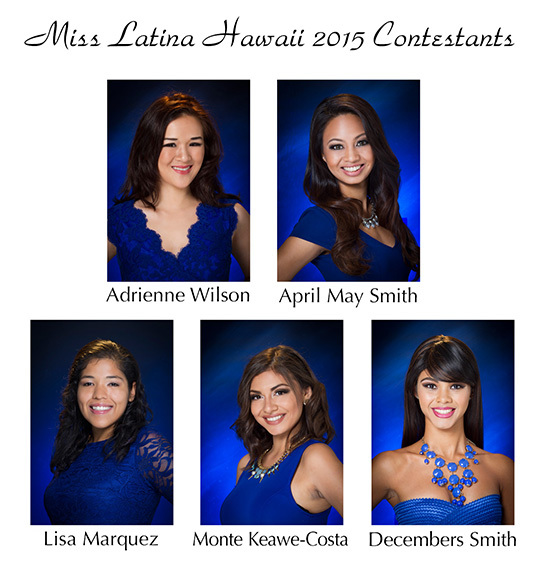 The new Miss Latina Hawaii will represent the Hispanic Community at the Miss Hawaii Pageant, then if she wins she will represent the state of Hawaii nationally. With your generosity and charitable support, this organization can continue to thrive. The scholarships offered to the women competing in the pageant will help them succeed endeavors.